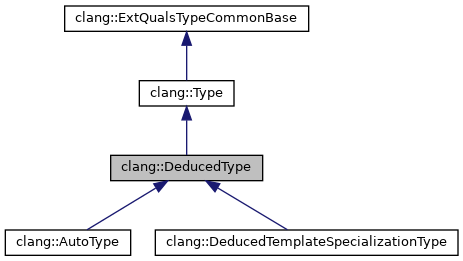 Common base class for placeholders for types that get replaced by placeholder type deduction: C++11 auto, C++14 decltype(auto), C++17 deduced class template types, and (eventually) constrained type names from the C++ Concepts TS. These types are usually a placeholder for a deduced type. However, before the initializer is attached, or (usually) if the initializer is type-dependent, there is no deduced type and the type is canonical. In the latter case, it is also a dependent type. Definition at line 4721 of file Type.h. Definition at line 4723 of file Type.h. References clang::Type::containsUnexpandedParameterPack(), clang::Type::isDependentType(), clang::Type::isInstantiationDependentType(), and clang::QualType::isNull(). Definition at line 4754 of file Type.h. Definition at line 4743 of file Type.h. Get the type deduced for this placeholder type, or null if it's either not been deduced or was deduced to a dependent type. Definition at line 4747 of file Type.h. 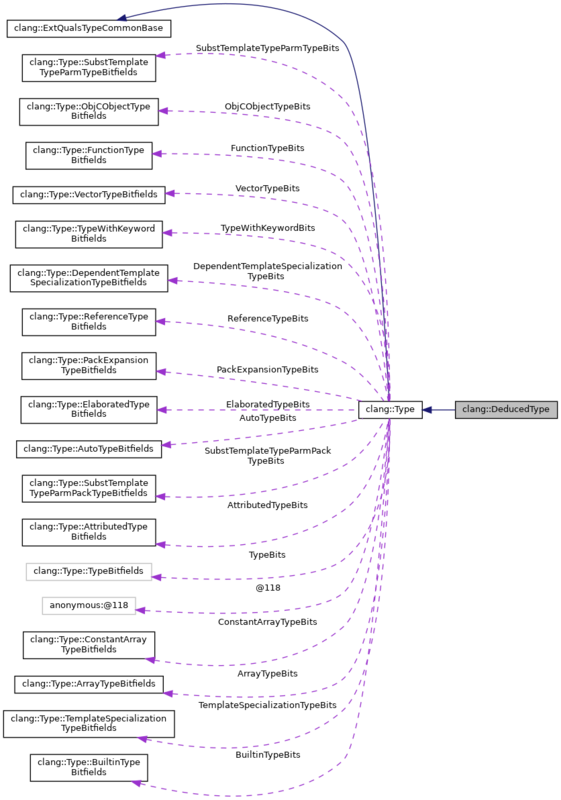 Referenced by addExceptionSpec(), clang::Sema::BuildDeclaratorGroup(), clang::getParameterABISpelling(), mangleAArch64VectorBase(), clang::TreeTransform< Derived >::RebuildQualifiedType(), clang::TreeTransform< Derived >::TransformExceptionSpec(), and clang::ASTNodeImporter::VisitAutoType(). Definition at line 4750 of file Type.h. Referenced by clang::Sema::DeduceFunctionTypeFromReturnExpr(), clang::isUndeducedReturnType(), clang::TreeTransform< Derived >::RebuildQualifiedType(), and clang::TextNodeDumper::VisitAutoType(). Definition at line 4742 of file Type.h.